Are all Chem-Dry franchises the same? Are you insured and police cleared? What areas of Adelaide do you serve? My carpet seems to be getting dirty more quickly since my last cleaning. Why? Can I spot clean my carpet with detergent or soapy chemicals? Will cleaning remove the protection from my carpet? Does professional cleaning make my carpet wear faster? It has been a year since my last cleaning. Do I need to clean my carpet again? It doesn’t look too bad! Should I clean the carpets or replace them? Which method do you use to charge? By room, time or by square meter? You are not the cheapest one. Why should I choose you? Why do your prices vary from other Chem-Dry franchises? Why are there many carpet cleaning businesses advertising low prices? If 3 rooms is $105, why is 1 room $105? I have stains on my carpet. Will it cost me more to get them removed? My carpet is heavily soiled. Will it cost me more to get it cleaned? What are considered additional charges? What else should I do before the technician arrives? Do I need to do anything special after my carpet is cleaned? I live in a rental property. Why should I care about paying more for a quality cleaning? It's not mine anyway. Is your cleaning appropriate for end-of-lease exit? Should I have my carpets cleaned before or after the bond clean? Are you going to make a mess on my clean hard floor? Are you able to pick up the keys from the real estate agent? Do I need to be present at the appointment? How do you charge? By sqm? Does anyone need to be there? I am looking for the cheapest one. Should I call you? My carpets are very soiled. Can you handle the job? How do I compare different quotes? What if something gets damaged during cleaning? Can you do the job while we are working in the office? Do you offer flexible hours to suit my business needs? Can I request a free on-site quote? Q: Are all Chem-Dry franchises the same? Chem-Dry is the world’s largest carpet cleaning franchise, present in Australia in every estate. All franchisees abide by Chem-Dry standards and procedures, although the cleaning system used by them to clean carpets may vary from franchisee to franchisee as Chem-Dry has a number of different approved systems. It ranges from the bonnet system (commonly used for dry cleaning services) to hot water extraction via a portable machine or truck mounted system. Q: Are you insured and police cleared? Yes, our business is fully insured and our technicians are police cleared. Please feel free to request a copy of these documents if necessary. Most of the services we provide are 100% Satisfaction Guaranteed. Please refer to our 100% Satisfaction Guarantee terms and conditions for more details. You can either call us between 9am and 5pm Monday to Saturday or place your booking via our online booking system. We highly recommend taking advantage of our easy online booking system, where you can check prices, check availability and place a booking 24/7. However, if you need an urgent booking please give us a call. The earlier the better! We receive many booking requests by phone and online. Therefore, to secure a day and time that best suits your needs be sure to call us at least 3 days prior to your booking date. During peak times however, this can extend to a week or more. Q: What areas of Adelaide do you serve? Please click here to see the list of suburbs currently covered by our business. Chem-Dry On The Spot is a 100% comprehensive cleaning process, which is a combination of the “pros” of dry cleaning and steam cleaning while avoiding their “cons”. This is an effective way to overcome the limited cleaning power of dry cleaning and the danger of over-wetting carpets usually associated with steam cleaning. Comprehensive cleaning gives you a deep clean with a quicker drying time. 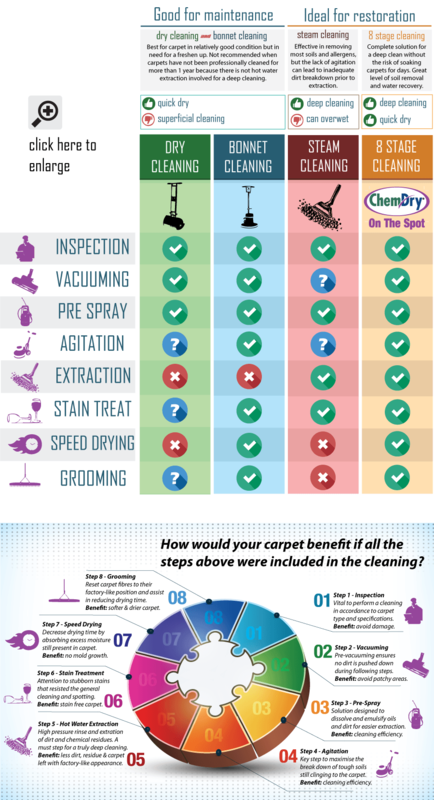 See our infographic here and understand the difference between a varied carpet cleaning systems. Q: My carpet seems to be getting dirty more quickly since my last cleaning. Why? Many regular steam cleaners and DIY machines rely solely on soapy cleaning chemicals to clean carpets. When soap residues are left behind due to improper cleaning or equipment, they attract dirt like a magnet, making your carpet dirtier sooner. Q: Can I spot clean my carpet with detergent or soapy chemicals? Big "No!". Unfortunately, many home owners spot clean their carpets with soapy cleaners. To make things worse, they often apply way too much believing that the more of the product used the cleaner the carpet will get. At first glance, problem solved… and the stain/spot seems to have been removed. However, to the home owner or occupier’s surprise, after a few days or so a black spot will “appear on the carpet from nowhere”. The truth is that without a rinse, this soapy solution will dry and because it is made from petroleum surfactants, it will attract and hold dust, grease and soil. Q: What are reoccurring spots? It is a common problem also known as wicking. When a substance seeps through the carpet to the backing material or even the under pad, it can get trapped in there. When your clean the stain, you are cleaning the top only of the carpet therefore you aren’t getting the spill out completely. During the drying process, the carpet may reabsorb the stain as the substance slowly creeps up the fibre strands returning to the surface. It needs a localised hot water extraction system followed by the application of specialised chemical solution to avoid re-soiling. Depending on the severity, under pad replacement may be recommended. Q: Can you get stains out? The success will depend on the stain itself, type of carpet and age of the stain. Please see our “Carpet Stain Removal” page to check for our Stain Removal Chance of Success table. Q: How should I maintain my carpet? Vacuum your carpet frequently, react quickly to any spills and professionally clean your carpets every 6 to 12 months. For further advice, please see our “Never Do These 5 Things to Your Carpet” and “Carpet Cleaning Tips” articles. Q: Are Chem-Dry products safe for my kids and pets? We clean your carpets and upholstery with minimal impact on the environment using Chem-Dry’s safe and non-toxic cleaning solution, The Natural®. It is 100% non-toxic, natural, known as one of the purest carpet cleaning solutions available and is the heart of our cleaning process. Q: Can other carpet cleaning methods actually hurt my carpets? Yes, regular steam cleaners can pump excessive amounts of soapy water with a weak vacuum power, soaking your carpets for days and creating a perfect breeding ground for mould and quick re-soiling. We use just a fraction of water compared to most steam cleaners, leaving nothing behind but a drier, cleaner carpet and a much healthier environment for you and your family. Vacuuming and hot water extraction certainly removes some fleas, but for an effective treatment seek professional help in pest control that is licensed in the use of pest management chemicals and safe application procedures. Q: Will cleaning remove the protection from my carpet? It is not supposed to. There are a number of harsh chemicals out there that can destroy carpet protection. Our core solution The Natural and several other Chem-Dry consumer cleaning products are green-certified products with a neutral pH level which won’t destroy your carpet protection. Q: Does professional cleaning make my carpet wear faster? No. Actually, professional carpet cleaning is highly recommended by carpet manufacturers to prolong the life of this type of flooring. Carpet can hide a lot of gritty soil and sand which act as abrasives; when the carpet is walked on the abrasives rub against the fibres, causing it to wear prematurely. It is recommended by the Environment Protection Authority (EPA) that carpet cleaning should be carried out at least once every 6 to 12 months depending on family size and lifestyle. This frequency could be higher if you are especially susceptible to allergies caused by dust mites or other debris on the carpet. Q: It has been a year since my last cleaning. Do I need to clean my carpet again? It doesn’t look too bad! Modern carpets are designed to hide dirt. And the longer the fibre, the more dirt, sand, dust mites and other pollutants can be hiding under there. Professional carpet cleaning will not only extend the life of your carpet but will also reduce indoor allergens, therefore contributing to better indoor air quality. Q: Should I clean the carpets or replace them? It depends on the overall condition of your carpet. Severe problems with irreversible soiling, staining, wear and tear and urine contamination may suggest the need for replacement. Please ask our technician for expert advice for your individual case. Q: Which method do you use to charge? By room, time or by square meter? We charge per room. However, there are situations when we may consider charging according to time spent. As an example, a house where an excessive amount of furniture shifting is required will dramatically increase technician’s time on the job, which may make our service time not profitable to charge per room only. Q: What is considered a room? We classify a standard size room as any area up to 15sqm, currently at a cost of $35 plus gst. For larger areas an additional charge applies. Q: How can I get a free quote? By giving us a call or clicking on our website’s “Get Pricing” section. Q: You are not the cheapest one. Why should I choose you? Q: Why do your prices vary from other Chem-Dry franchises? All Chem-Dry's are independent owned and operated franchises with their own price list. Q: Why are there many carpet cleaning businesses advertising low prices? Considering all the expenses of running a professional carpet cleaning business, the only way these businesses could turn a profit is by using cheap harmful cleaning solutions, low end cleaning equipment, rushing through the job, and paying the lowest rates to their technicians, not to mention not having appropriate insurance liability in case of any damage to your carpet. Q: If 3 rooms is $105, why is 1 room $105? Because our minimum service fee is $105 plus gst. You can have up to 3 standard size rooms covered in this cost or even add other service such as sanitisation and carpet protection or even upholstery cleaning to reach the minimum. Q: I have stains on my carpet. Will it cost me more to get them removed? Our cleaning process removes most stains from your carpet; however, there are situations where the removal of a stain requires a specialised treatment. (Examples are red wine, pet urine, blood, coffee and rust.) The treatment option attracts a surcharge and will be discussed with you prior to work commencement. The cost depends on the amount of extra time we have to spend to remove or minimize the stain. Unfortunately, we cannot guarantee a total removal of all stains as some substances can cause permanent discoloration of the carpet fibres. Q: My carpet is heavily soiled. Will it cost me more to get it cleaned? It can, because additional time and cleaning solutions may be necessary to break down heavy grime and soil from your carpet and therefore achieve the optimum cleaning result. Please let us know upon booking about the condition of your carpet. We prefer to discuss final cost when on-site to better evaluate the condition of your carpet and therefore avoid potential overcharge. You can decline the final price with no cancellation fee. Q: What are considered additional charges? Extra services such as the cleaning of heavily soiled carpets, stubborn stain removal, urine and faeces removal and excessive furniture shifting. Also, add-ons such as sanitiser or deodoriser application and protectant application. No, there is no cancellation fee. However, we request and would greatly appreciate it if you could notify us at least 24 hours prior if you wish to cancel your service. This will save us not only time but a lot of effort and preparation that goes into each job that we undertake. Q: How can I pay for your service? Payment is made directly to the technician on-site following the completion of the job. Accepted payment options are cash, debit or credit card (Visa and MasterCard). If you cannot be on site with the technician, payment can be processed via credit/debit card over the phone. Q: Do you move the furniture? We go around heavy and delicate furniture items that are hardly ever moved, and ask that you move your smaller items such as lamps, dining chairs, office chairs, magazines racks, etc. We can assist you with lounge suites, armchairs and coffee tables, sliding them as we go. If you want us to cover from wall to wall please clear the area prior to our arrival. Q: What else should I do before the technician arrives? 1) Move items off the floor such as shoes, boxes, etc. 2) Do not block access points to water and electricity. 3) Also, if you can, please leave a spot for our van in your car park; we would greatly appreciate it so we can unload our gear easily. You are not expected to vacuum the carpet as this is included in our service. However, if the carpet has excess debris we would suggest that you give it a quick vacuum to remove the bulk and avoid any surcharge. Please note that the table below is an average time guide only. Accessibility and soiling conditions of the flooring or upholstery items might increase time spent on site. Q: Do I have to stay home while you clean? No. We are sometimes left alone to do the job while the client goes out. Some customers pay us in advance and leave us in charge of locking the house when we leave. Others leave the keys under the mat for us to access the house. Although this can be arranged, we cannot be held responsible for any consequences that may arise from this before our arrival or after our departure. Carpets with normal soiling usually take 1-2 hours to dry if the indoor temperature is about 24 degrees Celsius; it may take longer if your carpet fiber is dense or long. Soiled carpet areas also might take slightly longer to dry as we may have to cover the same area twice for the best result. The technician will give a more accurate drying time as soon as the job has been completed. In cooler weather conditions we suggest switching on the heating system to allow the air to circulate and help remove moisture from the air, as this will speed up the drying time. Q: How soon can I walk on it? You can walk on the carpet immediately after the job has been performed, even if the carpet is still not totally dry. Please make sure your shoes or bare feet are clean to avoid leaving any footprints. Q: Do I need to do anything special after my carpet is cleaned? 1) Don’t walk on wet carpet with dirty shoes or feet as you might leave footprints. 2) Don’t place legless furniture or items like mattresses straight onto the wet carpet as it can create mould. Carpet needs to “breathe” to dry completely – ensure moisture can evaporate. 3) Keep your house warm with air circulating when possible to help speed up the drying time. Q: How can I take care of spots in between cleanings? React quickly to any spills to avoid staining. Chem-Dry spot remover spray is a professional strength carbonated solution that lifts spills from your carpet without leaving any bleach marks. Ask our technician for a demonstration after your cleaning. Q: I live in a rental property. Why should I care about paying more for a quality cleaning? It's not mine anyway. When you hire a non-qualified carpet cleaner, chances are that the cleaning result will not be good enough for your real estate agent. A dispute between you and your agent/landlord can be tedious, time consuming, and will certainly delay your bond refund for weeks. Remember, the carpet cleaning industry is unregulated and many non-insured small businesses in this field can cause permanent damage to the carpet and underlay. This may leave you with the expense of replacing them, which can cost on average $500 for a 15sqm room. Q: Is your cleaning appropriate for end-of-lease exit? Sure is! A receipt as proof of the professional service is provided on-site following the completion of the service. Alternatively, you can request us to email you the receipt for forwarding on to your property manager. Q: Should I have my carpets cleaned before or after the bond clean? After, in order to keep the carpet clean and well presented for the final inspection. Q: Are you going to make a mess on my clean hard floor? No, we clean your carpet and clean up any spills that occur. Q: Are you able to pick up the keys from the real estate agent? Yes, we can collect and return the keys to your real estate agent as long as they are located relatively near your rental premises. Q: Do I need to be present at the appointment? No, we just request that payment be made in advance or on completion if you are planning to return before we finish. Q: Do you need electricity? Yes, we need electricity to power on our equipment. We do not carry a generator in our van. Make sure to organise with SA Power Networks to have your electricity disconnected the day after your carpet cleaning service. We always recommend take additional measure of leaving a note inside your power box with your nominated day for disconnection in order to avoid any surprise - yes, it is not uncommon for us to turn up to residences where the power was disconnected earlier than the schedule. Q: How do you charge? By sqm? Commercial premises are charged based on area size (square metres), unless the location is based in a house setting. Rates per square metre vary depending on the type and condition of your carpet, accessibility from the parking area, as well as the day of the week and the time at which you request the work be carried out. We will send you an invoice with the following payment options: online transfer, credit card or cheque. Alternatively, you can pay immediately after the service, in which case cash is also acceptable. Q: Does anyone need to be there? Not necessarily, but this will obviously depend on your company’s procedures for tradies. In most cases, we are let in by a member of staff and at the end of the job we give that contact a call to inspect the work and lock the premises. In some other cases, your cleaner can give us access to the relevant areas. Q: I am looking for the cheapest one. Should I call you? Our rates for comprehensive cleaning start at $1.50 per square metre. We offer “one step above” dry cleaning and steam cleaning, which involves more equipment and time spent on site to maximise cleaning results. Therefore if you are looking to select by price only, we wouldn’t be able to help you. For a better understanding on how different carpet system works and for which situation they are designed for check this infographic. Q: My carpets are very soiled. Can you handle the job? Our cleaning system is perfect for getting the best from your carpet, even when it is in a soiled state. Please check our “before and after photos” for examples. Q: How do I compare different quotes? Bear in mind that there are a variety of different carpet cleaning system which will give you different cleaning results. Please see the infographic here to understand what you get from these different systems to help you make a decision. If the rates are similar for dry and steam cleaning versus comprehensive cleaning, then it would make more sense to go with comprehensive. Q: What if something gets damaged during cleaning? We treat your premises with care and respect, however if something unexpectedly breaks due to our negligence we will replace it for you. We are fully insured to cover your company in case of any loss or injuries. Q: Can you do the job while we are working in the office? Yes we can, but ideally the job should be done when the office is empty or when there are fewer members of staff present as we will have to move some furniture and chairs. The sound of our equipment may distract staff or interfere with phone calls. When we clean hotels and retirement villages, the work is carried out at times that best suit the business’s specific needs. Q: Do you offer flexible hours to suit my business needs? Yes. During your on-site quote please inform the technician of your preferred times. Q: Can I request a free on-site quote? Yes. You can call us on 08 8272 2222 or online by leaving your details here.